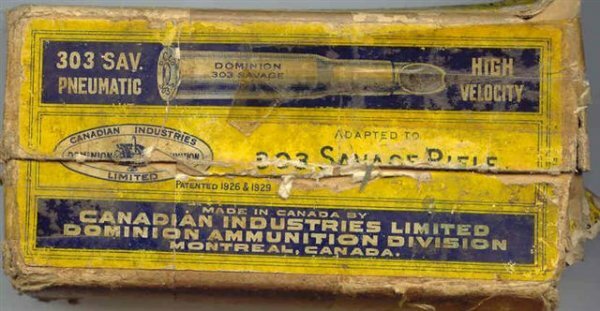 The pneumatic bullet was first mentioned in the Dominion Ammunition catalogue # 18 (1924) and last mentioned in catalogue # 22 (1948). It was replaced by the "copper point expanding bullet" in the 1952 (# 23) catalogue. The projectile was developed to avoid deflection in the bush. 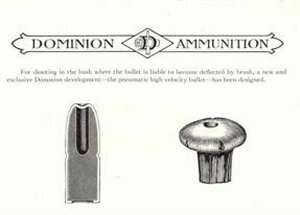 As the Dominion Catalogue states "It has an "air-chamber ensuring the bullet mushrooming perfectly on hitting the point at which it is aimed. The bullet is particularly adapted for use in magazine rifles." The .303 Savage Pneumatic became available in 1930, (cat.# 19). Note the earlier box which mentions "patented in 1926 and 1929". Particular thanks to Jean Dozois for providing this information and box labels.